Wednesday August 19 1908 I got my work done so I started down to Stevens at eight oclock. I took Mother with me. We had a nice ride and a good visit Mr & Mrs Robinson and Frankie [Pointoin?] & Ned were there too. I did the evening work after coming home. I got here a little after six though I stopped at Woolfs a little time. 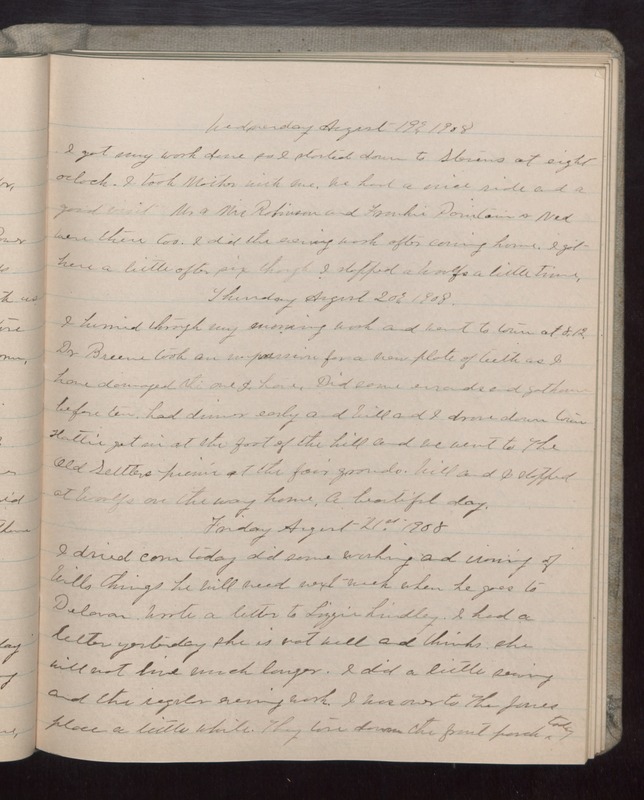 Thursday August 20 1908 I hurried through my morning work and went to town at 8.12 Dr [Breene?] took an impression for a new plate of teeth as I have damaged the one I have. Did some errands and got home before ten. had dinner early and Will and I drove down town Hattie got in at the foot of the hill and we went to The Old Settlers picnic at the fair grounds. Will and I stopped at Woolfs on the way home. A beautiful day. Friday August 21st 1908 I dried corn today did some washing and ironing of Wills things he will need next week when he goes to [Deloran?]. Wrote a letter to Lizzie Lindley. I had a letter yesterday she is not well and thinks she will not live much longer. I did a little sewing and the regular evening work. I was over to the Jones place a little while. They torn down the front porch today.